That is the title of the video. The list is obviously made by a bunch of ignorant Millennial Cretins! Most of the cars are not ugly, just old. And of course the list includes our FCs! I cant believe they didn't include the 914 Porsche, but the list obviously was made by a bunch of ignorant Millennials!! I understand millennial can sometimes be catch all, but maybe back off of that group a bit. After all, we are the ones who will be buying your cars from your family. or letting them be scrapped. > from your family. or letting them be scrapped. Unlike "Baby-Boomers", "Gen-X", and such, I see "Millennial" as a mind-set rather than an age group. And quite frankly, I would rather see my cars scrapped than let them fall into the hands of one of those "safe space, tree-hugging, snow-flakes ! ! ! > of those "safe space, tree-hugging, snow-flakes ! Just to be clear, you care so greatly for your Corvairs that you would rather crush them so no one gets to ever enjoy them again, than allow someone younger than you to maintain it and preserve it for the future? > preserve it for the future? Direct quote - " I would rather see my cars scrapped than let them fall into the hands of one of those "safe space, tree-hugging, snow-flakes ! ! !" NO WHERE at all did I mention AGE. As I stated, "Unlike "Baby-Boomers", "Gen-X", and such, I see "Millennial" as a mind-set rather than an age group." There are actually many people my age or older, who are "Millennial" in mindset and character. Those people are not fit to inherit the finer things created by hard working AMERICANS. I like the Pacer (side rear windows anyways). Tim- baby boomer here. Father of millennials. 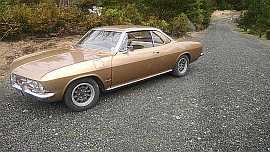 > I like the Pacer (side rear windows anyways). > Tim- baby boomer here. Father of millennials. I'm with you on the Pacer. Certainly a unique shape. Looks like it would be fun to be seen in one for a short time. Interesting note on the Pacer. The passenger side door is longer than the drivers door. This strange feature makes climbing into the back seat easier. > Interesting note on the Pacer. If memory serves me correctly, the passenger side door was deliberately designed longer to encourage people to enter and exit the rear seat from the curb side. I think the passenger door was about 4" longer than the driver's side. This wasn't the first time the automotive engineers were actually looking out for the welfare of others. If you look at many of the 1930's era vehicles, you might notice that there is no door lock cylinder on the outside of the driver's door, only the passenger door. This again was an effort to encourage entry and exit from the vehicle on the curb side....even way back then. One of these days we will hear about a three door passenger vehicle.....You know, one door on the driver's side and two on the passenger side. Oh wait....that would be called an early Chevrolet Suburban. 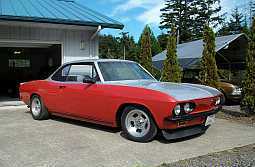 Then again I think someone here mentioned they are doing this to a Corvair too. Don't mind me, I'm just having fun. Don't forget the Hyundai Veloster. 1 driver side door, 2 passenger side doors. I don’t consider the greenbriers nor the rampside ugly, and I’m 16. To be honest, I’m sad that I missed out on the great muscle car era. I know I will be one of the few people in the future who will try to keep the classics around and not drive an electric car. Edited 1 time(s). Last edit at 11/10/2018 05:23PM by LeadFootLogan. I happen to be the proud owner of the red rampside with the Oregon plates. I’d love to have one of those Greenbriers! I had a'66 Monza vert that was Click & Clack's cover car for a while.